At least three security officials were martyred whereas seven others received injuries in a suicide attack in Kabal area of Swat, the Inter-Services Public Relations (ISPR) reported on Saturday. The attack was carried out at a sports unit of an army camp, the military’s media wing said in a statement. Initial reports suggested that the bomber blew himself up in a ground where soldiers were playing volleyball. 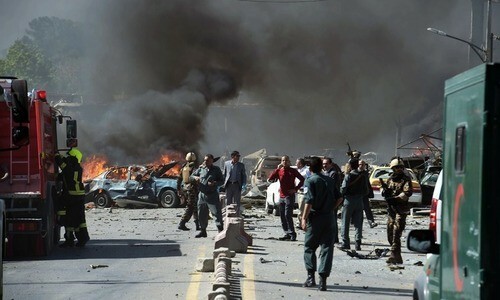 According to some sources, as many as 16 people were injured in the blast. All the injured were shifted to Combined Military Hospital Saidu Sharif. Although peace had returned to Swat after a military operation in the valley in 2009, security has been a primary concern in the region. Police and armed forces personnel jointly man several checkpoints. There are approximately 6,000 policemen in Swat and most of them are deployed on checkpoints. A few days ago, the Swat police claimed to have arrested two militants, in the same area, allegedly involved in anti-state activities during spillover of militancy to the Swat valley. According to Kabal police, following a tipoff, they along with the CTD police raided a house in Kabal where they found a wanted militant, Siraj Khan, and arrested him. In the meantime, the CTD police carried out another raid at Shawar area in Matta tehsil and arrested a militant commander, Mohammad Ali Shah, who was allegedly involved in attacks on security forces.